Since 1980, the number of American families with children and grandparents living together has doubled. Courtesy of Adobe Stock. Out on the deck one morning, my 80-year-old mother dribbles her basketball. It’s a pastime she picked up in recent years to maintain her agility. My 7-year-old twins join her. They take turns sinking baskets into the net, which is set at the lowest level. But their efforts are impressive all the same. Our household is bustling from before dawn, when the boys wake up and hop in bed with me and my husband for a cuddle, until late at night, when my mother finishes watching her Chinese soap operas while pedaling on her stationary bicycle. Nearly seven years ago, my father passed away. Though my mother was still working full-time as a research scientist, I worried about how she would be able to take care of their vast house if she lived alone. In our family, our deepest emotions weren’t expressed verbally. My parents never told me “I love you,” yet I knew they cared for me every time they plucked plump prawns from their own bowls to serve me. I felt a duty to return that love, to leave Southern California for my childhood home in the hilly suburbs east of San Francisco. My husband agreed, even though we would miss our ranch house with an avocado and apple tree in the backyard, decorated with art from our travels abroad, where our boys had taken their first steps. Some friends and colleagues questioned our move, but I had lived with three generations under one roof in the past. Decades ago, my widowed grandmother moved in to care for me and my brother and sister, so that my immigrant Chinese parents could devote themselves to their demanding careers in science and engineering. 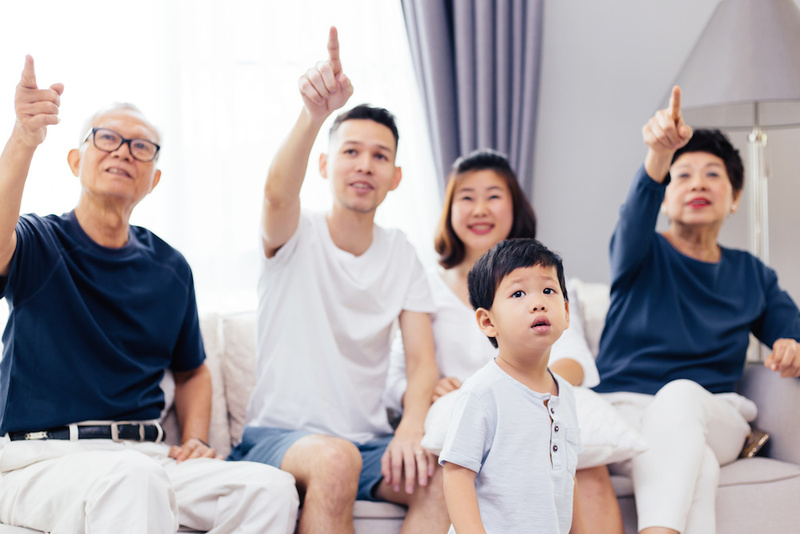 Currently, about 29 percent of Asian Americans live in multigenerational households, according to a study by the Pew Research Center. Since the Great Recession, moving in together has become a trend across all demographic groups in the U.S., but the figures differ by race and ethnicity. Latino and African American families trail Asians by a few percentage points, while only about 16 percent of whites live with multigenerational families. But the percentage of American homes with multiple generations is double what is was in 1980, when only ten percent did so. All told, 64 million Americans lived in multigenerational homes in 2016. When I was a child, the fact that my grandmother lived with us was an oddity, but that’s no longer the case. Some families live together to reduce financial stresses; in our case, it’s a cultural preference. While the arrangement is becoming more common, it’s not always easy. When we moved to the Bay Area to live with my mother six months after my father’s funeral, she and I bickered over how to share space. I would sort through clutter she wasn’t ready to clear and she’d nag me for being on my phone too much. As the years have passed, we’ve settled in. The boys often nestle on the rug in the living room to watch television with her. They’ve forged a bond that they might not have if we’d remained hundreds of miles away. In her, they have a role model, the same one who shaped me: an intelligent, ambitious, and determined agricultural scientist. I hope that her example—and mine—as working mothers will help my sons to become more egalitarian in their future relationships. A study of more than 100,000 people across 29 countries found that sons raised by working mothers devote more time when they are adults to domestic work and caring for their children. Already, my sons have said they’ll look after us when my husband and I are old. My mother doesn’t have the time or inclination to babysit on a daily basis, but every couple months or so, after we’ve put the twins to sleep, my husband and I can go out for a free date. All told, 64 million Americans lived in multigenerational homes in 2016. When I was a child, the fact that my grandmother lived with us was an oddity, but that’s no longer the case. Living together has come to suit our family, and makes me reconsider American notions of independence. Studies suggest that living arrangements like ours may increase psychological, social, and financial resources—all factors associated with increasing health and longevity, if it leads to improved finances and reduces loneliness and stress. Living with us—not to mention her time at the hoop—may also benefit my mother, too. Higher levels of social interactions, even peripheral ones, can help stem cognitive decline among the elderly, research suggests. In one study, more than a thousand seniors without dementia at baseline were tested over a 12-year period for cognitive function and social activity levels. Those who maintained frequent social contact, had a rate of cognitive decline that was 70 percent less than among the seniors who didn’t have such contact. People often assume my family is privy to everything in each other’s lives, but it’s nearly impossible to keep track of everyone’s schedules, let alone try to coordinate them. My mother is a night owl, and we’re early birds. Every so often, though, we’ll go to a local science museum together, where my mother tries out the exhibits with excitement matching our boys. Or we’ll attend the crab feed, Easter Egg Hunt in the park, or another activity sponsored by the Rotary Club, which she joined in her attempt to find fellowship without my father at her side. For the most part, though, we maintain our independence. With our own social and professional circles, no one feels left out of the airy, four-bedroom home that my father, a structural engineer, designed. He also planted a grove of redwood trees that now tower higher than the roof, providing dappled shade. After crossing continents and oceans to immigrate, my mother has come to think of this neighborhood—with its wide sidewalks and trees and views—as paradise. Here, she drives familiar roads to her office, shops, and health care providers. My mother can age here in the place she loves because my husband and I manage many chores, and because we can take her to an occasional medical appointment or to visit friends who live farther than where she’s comfortable driving. My siblings also pitch in wherever they can. The morning has flown by. Opening the door onto the deck, I call my boys in, so that we can get ready to go out this afternoon. They each want to sink one last hoop, and then I take a turn. It wobbles on the rim, and then goes in. My mother follows close behind, about to set off on her own adventures for the day. Vanessa Hua is a Bay Area native and a columnist for the San Francisco Chronicle. She is the author of Deceit and Other Possibilities and the novel A River of Stars.